A Channel is a way to update dynamically applications on your robot. Subscribing to a Channel, ensures the applications you need are automatically added, updated, and removed, when necessary. Make sure you are the owner of the Aldebaran robot. 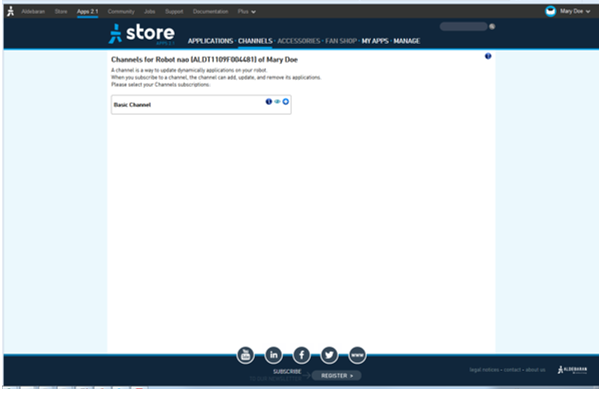 On the Apps 2.1 Store, choose Channels. For further details, see: Accessing the Apps 2.1 Store. Click the plus button of the Channel you want to subscribe to. As soon as your NAO is turned on and connected, the Channel will automatically update the last release of the applications and resources included in the Channel. The application will be installed at the next robot update. For further details, see: Updating your NAO. Basic Channel - What can I say to NAO.